The only craft I have come across using Guelder Rose wood is the making of skewers for barbecues. 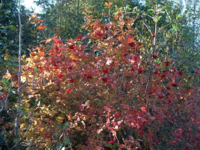 Wands are also made from Guelder Rose for various enchantment rituals at Samhain. This is believed to be connected to the calming effect that cooked or fermented Guelder Rose berries have. There are traditional associations between Guelder Rose berries and those passed on, but the connection is unclear, though some Wiccan people have created rituals that include them. Guelder Rose wood is not used as firewood or kindling though..
Would you like to join us for Bards In The Woods gatherings and retreats?